The Clean Vehicle Rebate Project operated by the California Air Resources Board (CARB) has exhausted the funding for zero emission vehicle rebates. Over 27 months the project doled out over $11 million for rebates on close to 2,000 vehicles. The rebates ranged from $1,500 to $5,000 depending on the type of zero emission vehicle eligible – ranging from an electric motorcycle or NEV to highway capable passenger cars. CARB is proposing an expansion of the program by increasing funding to $15 million for 2011-12 and cutting the maximum rebate in half to $2,500 to allow a greater number of rebates. GEM Acquisition – In a recent interview Polaris CEO Scott Wine discussed the company’s recent GEM acquisition. Commenting on the potential GEM under the Polaris umbrella he stated “…if you think about Polaris’ ability to drive innovative design and performance, we really like what we can do with the GEM technology and brand.” He also remarked that they view the GEM as a vehicle for the electric city car/commuter car market, which they expect to grow “significantly faster” than GDP. ….a 54kW electric motor and enough battery capacity to give it a 104 km (65 mi.) range. The German made high-torque motor can accelerate the 1,090Kg vehicle to a top speed of 120 km/h. This lightweight vehicle features a steel chassis with horizontal shock absorbers with a sturdy composite body and extensive use of polymer plastic materials. The BamBoo sits on 17″ AEZ three-spoke billet aluminum wheels and eco-friendly Goodyear “EfficientGrip” energy-saving tires. Gas Prices Driving Municipalities To Electric UTVs? Some recent news stories point to the impact of gas prices on the STOV market as local governments try to reduce fuel costs by turning to electric vehicles. In some cases capital expenditures are reduced as well when these vehicles replace pickup trucks or highway capable cars. The cost effectiveness of these vehicles, in part, explains why the UTV market is significantly outpacing growth in the overall US economy. 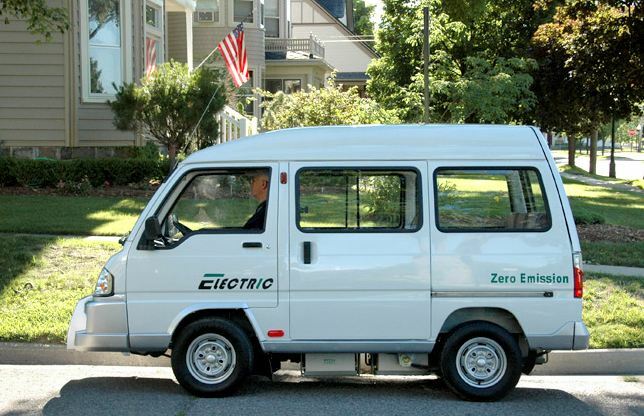 GreenGo Tek Electric of Michigan has won a contract to supply the state of South Carolina with ten all electric vans. The E-Dyne passenger vans are LSVs. The contract could potentially include the purchase of ten additional vans in an optional second year. The E-Dyne van is powered by either a 6-kW (8-horsepower) or an optional 25-kW (33.5-hp) electric motor and comes packing a 72-volt or an optional 96-volt absorbed glass mat (AGM) battery pack. Top speed for the E-Dyne is listed at 25 miles per hour and total range is a quaint 40 miles. The E-Dyne can be configured as an eight-seat passenger van or a two-seat cargo van.